Cubital tunnel syndrome or ulnar nerve entrapment is a condition characterized by compression of the ulnar nerve in an area of the elbow called the cubital tunnel. The ulnar nerve travels down the back of the elbow behind the bony bump called the medial epicondyle, and through a passageway called the cubital tunnel. The cubital tunnel is a narrow passageway on the inside of the elbow formed by bone, muscle, and ligaments with the ulnar nerve passing through its center. The roof of the cubital tunnel is covered with a sof t tissue called fascia. 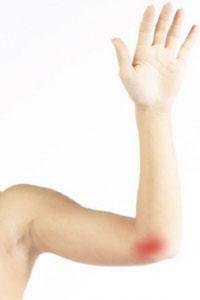 NSAIDs (non-steroidal anti-inflammatory drugs) such as ibuprof en or aspirin may be ordered to reduce swelling.